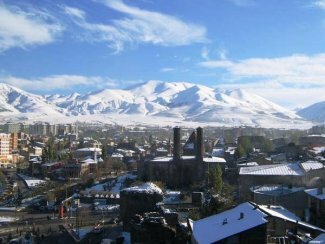 At 1,900 metres above sea level, Erzurum is the largest city of Turkey’s Eastern Anatolia region and has a population of nearly 400,000. 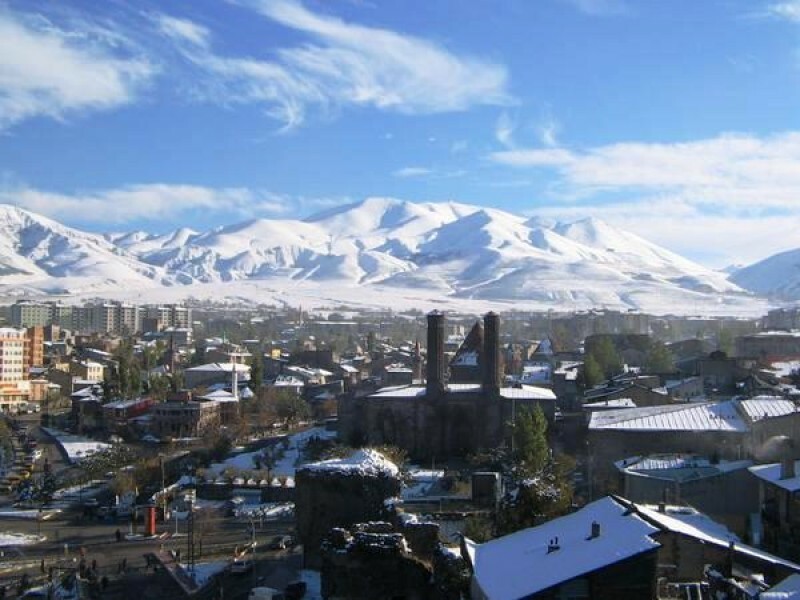 Erzurum is located 1300 kilometres east of Istanbul at the foot of the Palandöken Mountain (3,271m). The city has a 6,000 year old history and has been inhabited by Persian, Roman, Byzantine, Seljuk Turk and Ottoman civilisations. Today, the city boasts one of the largest student populations in Turkey, with 40,000 currently studying at Atatürk University. In January 2011, the 25th Winter Universiade (University Games) took place in Erzurum and the nearby ski resorts of Palandöken, Konakli and Kandilli. 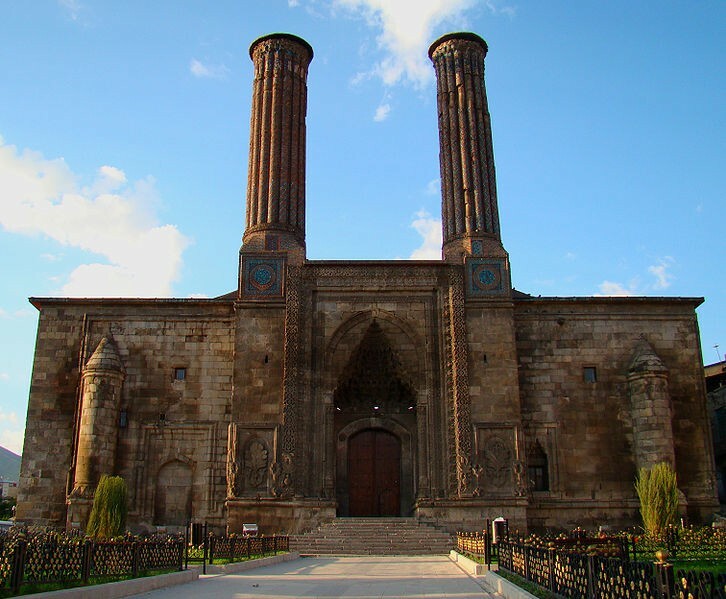 Erzurum is also famous for its semi-precious 'Oltu' stone - a black amber - unique to the region. 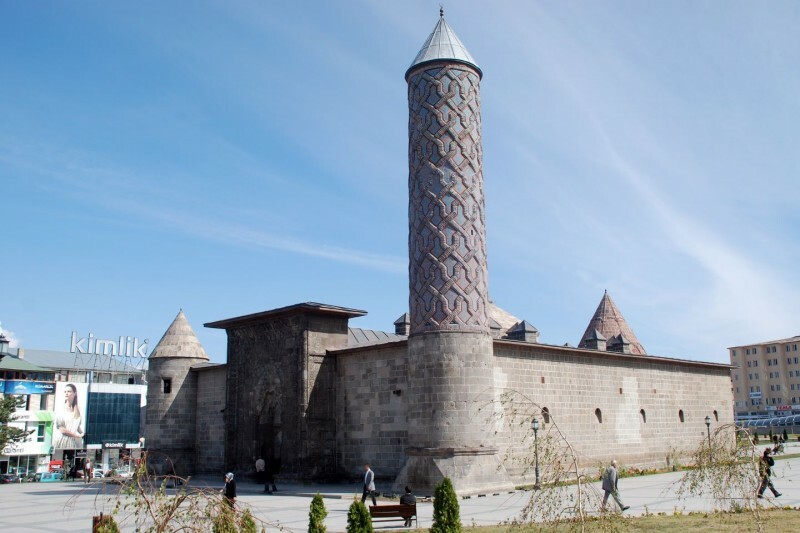 Erzurum appeals to antiquity enthusiasts with its well-preserved Seljuk and Ottoman buildings. The Twin Minaret Madrasa Çifte Minareli Medrese is named after its two intricately carved minarets and was built as a theological school by Seljuk Sultan Alaeddin Keykubat in 1253. The Yakutiye Medrese is a Mongol theological seminary dating from 1310 and is famous for its peculiar architecture and historic fort. The building is now houses Erzurum's Turkish-Islamic Arts & Ethnography Museum. The Covered Bazaar in the city centre is especially renowned for jewellery and decorative objects made out of world-famous ‘Oltu’ amber/stone. The museum was opened in 1942 and shows artifacts from the Bronze Age, and the Roman and Byzantine periods recovered from archaeological digs in the region. The castle stands 6 km from Erzurum and is generally regarded as being of Byzantine origin from the 5th Century. The Clock Tower in the inner castle mosque is of special interest. 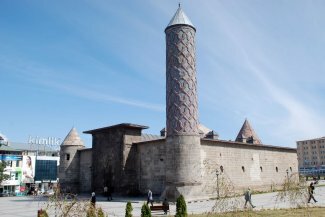 The tower was built in the 12th Century by Emir Muzaffer Gazi Bin Ebü’l Kasım, a ruler of the Saltuklu Dynasty. The ski resort on Mount Palandöken, with peaks rising to 3,185 metres, has been described as the world's second largest ski resort by the International Ski Federation. A 15-minute drive from Erzurum Airport, the resort offers skiing 150 days of the year. Palandöken is renowned for the longest ski run in Turkey. The 'Ejder (Dragon) Run' is 7,200 metres long and runs down from 3,100m to 2,200m altitude from start to finish. You can also link up with other runs for 20 kilometers of non-stop skiing. 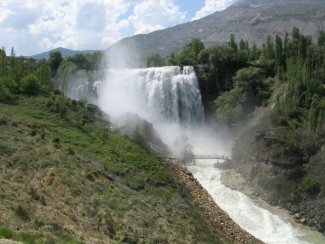 The waterfall cascading into Lake Tortum, 103 km to the north of Erzurum, is a wonder of nature. The force of the waterfall from almost 50m high is worth experiencing. The people of Erzurum come here in hot weather. While in Tortum, you should sample the ‘çağ kebab’ prepared by many restaurants. The region also offers activities like rafting and camping. Running along the border of Erzurum’s İspir County to Artvin, the Çoruh River receives rafting-enthusiasts from around the world. One of the fastest flowing rivers in Turkey, the Çoruh hosted the World Rafting Championship in 1993. If rafting is too much adrenaline, the natural beauty is still well-worth the visit. Coach buses run to Çoruh every day from the city centre and the trip last over three hours.